With their extensive and fully developed technology, ring electrodes EI RE provide a wide-ranging neutralization effect. The plastic processsing industry recognize them as an essential production aid with innumerable applications. The radial and central alignment of the electrode as well as a symmetrical choice of ions, together with large spacious punchthrough guarantee maximum efficiency and performance. Simple opening and closing: The two-part ring electrode can be opened for a short period of time during machine setting up. During production, for instance, this enables quick and uncomplicated changing of the film. Small but good: Minimal dimensions guarantee a wide field of application with the most diverse type of machines. Safe to operate: The high voltage parts are encapsulated and absolutely safe to touch. Simple installation: The patented, co-axial HAUG plug-and-socket connection System X-2000 guarantees assenbly/installation in seconds, without tools. 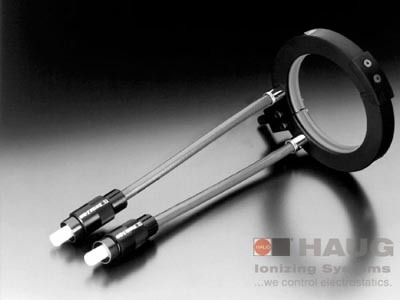 The ring electrode, with air support, can also be supplied as ring ionizer EI RIF . Plastic processing industry: on an extruder, during manufacture of plastic tubes, profiles, half-shells and bars and on plastic blow-moulding machines. Film/foil industry: during manufacture of plastic bags.